I’m back to my old tricks to add some interest in the foreground — a little motion blur never hurts. The new image stabilization technology makes these types of shots easy. I’ve done this many times with my Olympus, but even the compact Canon G7X Mark II does a decent job. This is with a 1/8 of a second shutter speed, handheld. 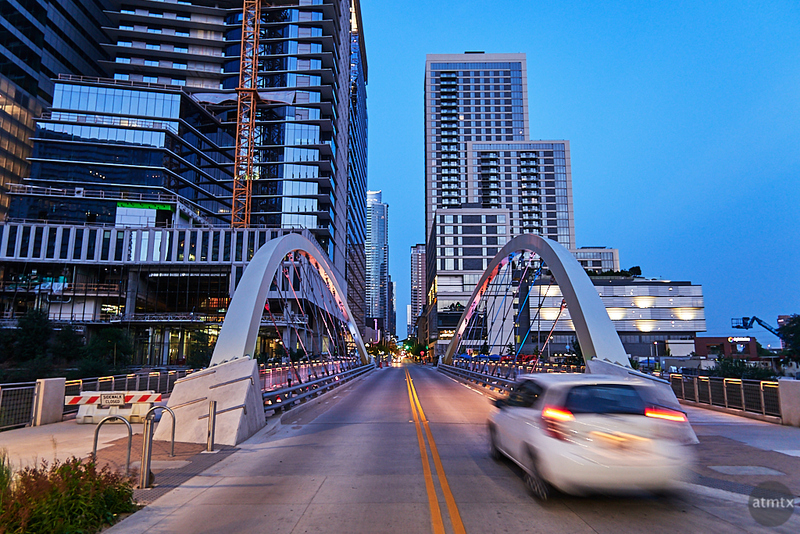 I really like how the city ties the new developments together on 2nd street with this compact bridge. If fact, the primary goal of this photowalk was to shoot this structure, but in a slightly different way. This photo was just a warmup. I’ll feature my intended image in a few days. Photographically, I wish there was more buildings on the right, to add symmetry and balance. I think there’s land to develop one more tower on the right, however, I’m not familiar with the plans. Love the car movement! It’s just perfect, enough to show the speed, but not so much that you can’t see it.